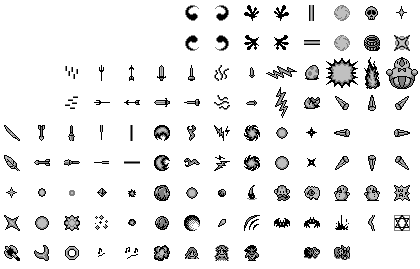 Some of you have seen it already: I started to work on mostly graphics and tilesets/maps for a little good old black&white TI83+ RPG project called Tornado (working title). Eventually this will maybe turn into be a revsoft group project (chickendude, I'm looking at you) or so and I want to have fun and go crazy with story and gameplay, but not so much mechanics wise. I mean it will be basically a 8x8 tiles screen scroller with RMEs (huh new abbreviation for random monster encounters ) and for my taste it would be nice to have some item collecting/alchemy/combination/crafting features aswell. That's also why the name is not fix and could be changed when I, we, you, decide on some game elements. Some graphic mockups and a tilemap scroll implementation screeny and a battle screen mockup follow oh and an inventory mockup. 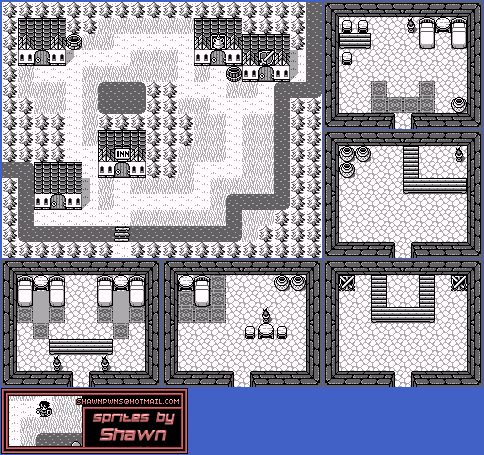 In the "random" tilemap there are differently shaped rooms and road connections (8x12 tiles) like "crossing" or "straight" or "T-scrossing" etc. which can be assembled randomly as in Dragon Quest Monsters! Yay! This looks and sounds amazing! I especially like the inventory and battle screens! Personally i'd prefer to have smooth scrolling, even if it's limited to 8 pixels at a time like in Pokémon. Another thing i've always wanted to do was let NPCs walk around. I don't think it really adds much to gameplay, but i've always wanted to do it anyway. I also really like games like FF7 where you can have lots of different party members including secret characters. I say toss a character on there and let's get started with the rest! This! This is gorgeous (is that how you spell that?)! Sounds like you guys will be more busy than usual now, but that's probably a good thing. You'll be working on amazing stuff. I got some player movement and some animation going! I mean, I can move, it's just that it moves to far off the screen in certain directions and in others it moves to little or however I should describe it..
Oh well, that's that project, this is this project. But it might have been similar gimics in other games too, like Dragon Quest Monsters (which IIRC you were inspired by). Oh right, I played Zelda:OOA too and I must say I love the two world principle in all Zelda games. In DQM there are lots of portals that teleport you to the monster world, you should watch a gameplay video: https://www.youtube.com/watch?v=6ibQeNDY2Y8&t=253 or download a ROM and play in an emulator . I've played one of the DQM games but I can't remember which one it was, it was really good though.. Maybe I should just *cough* download them all *cough* (as in the gameboy/gbc ones). For some reason I *think* it was the third one but like I said, I'm not sure..
EDIT: Looked at the video briefly and it looks exactly as the one I played. Is that the first one? That looks great, i especially love the water! Also, how does your animation work? I see the water moves slower than the portal thing, i dunno if each animated tile has its own counter or if you just draw each water frame twice. The transitions also look really nice! add and i just added a cursor to move around our tilemapper, once we get a little further maybe we should start a topic here, too. Map is copied from to a buffer. Then a routine switches out animated tiles to the next animation. The update refreshes different animation at different dividers of a set frequency. It's not very pretty right now, but I'm working more on the tileset atm. Awesome, what are the perpendicular intersecting lines that don't attach to anything for? Oh just for debugging, for me to see if is a straight line or an end. Do you have any idea as to how battles will work in the game? I think the current character looks ok, it just needs some animation when walking. It actually looks like a gargoyle or something super strong. Anyway, for characters, i think that 8x12 is a much easier format to draw sprites for and it's also not harder to draw on screen, just change the ld b,8 to ld b,12 in the main sprite loop (though then you'd need to mask the sprite). I already do mask the sprites. Also what do you do at the top most row when the sprite is 12 pixels high? Oh you scroll by pixel to prevent this, but I do not . Should I animate the walking in addition to the map update cycle? I'm not sure what you mean in the last part about animating the walking, though. The character is bound to be in good shape by the end of the game, though, they never stand still. I like all the animations, the knight in the first screen looks really cool. Currently the character is anmated at the same time as the map tiles (see the starts or the knight). In other games the character is animated only or additionally when he moves. I have two character sprites for each direction that I animate back and forth at a fixed cycle. But when you walk in the middle of the cycle the character doesn't animate, only move. I might want to change that. Also do you think the houses/trees are too small in comparison to the character? Zelda has much bigger trees (4 tiles). That looks like.. Wait, it is Pokémon. I also posted a list of series that are inspirational (for me at least) in the Idea's thread. Looks like Zelda, but I don't recognize the tent so it might not be. Or it might not be one game even, it might be two or more (except the original stuff for Tornado)! Still, it looks nice regardless of where it came from. The two brighter trees are the small 16x16 bushes from Pokémon . Church and tent are by me. Yeah, now it makes sense. More minimaps, now showing start and end point.